My kitchen smells like apples, and this time the scent isn’t coming from the hot apple pie candle on my stove. Columbus Day is one of those strange holidays; the girls and I had no school, and yet Ed had to go to work. So we decided to have a girls’ day out. Where to go on a beautiful fall day? 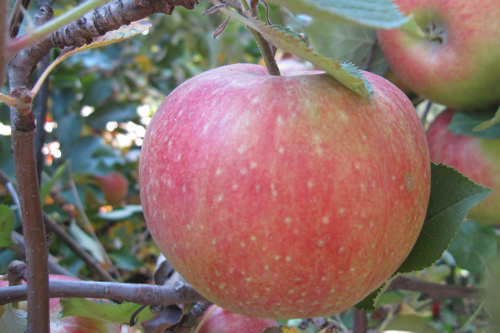 Why, the apple orchard, of course! I have one and a half pecks of apples in my kitchen as a result. Emmy is too busy to stay still for a picture! 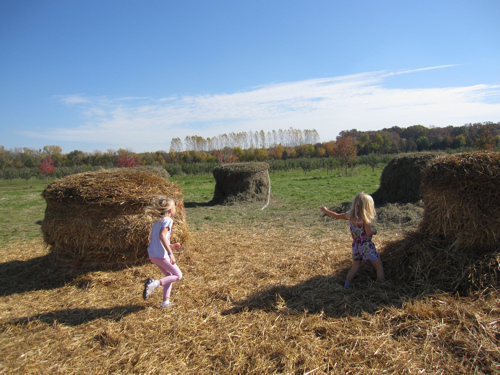 Going to the apple orchard is not just about picking apples anymore. There are slides and rides and animals to feed. 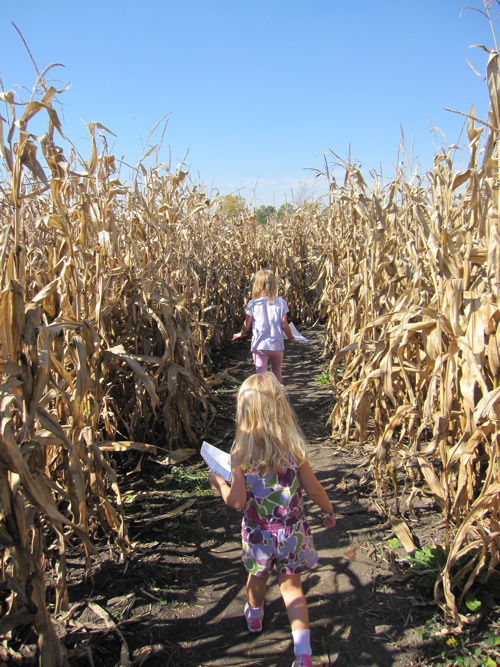 We also spent time wandering around in a gigantic corn maze, carved right into the corn field. 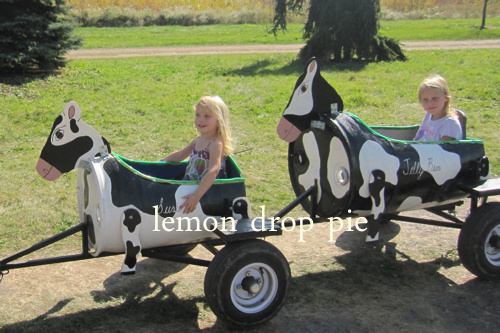 Before we left the orchard, there was one last thing the girls wanted to do: ride the cow train. Fortunately, Lily and Emmy are old enough to ride by themselves. I was not required to squeeze into a barrel cow, with my knees up to my chin, holding a child on my lap, as some unfortunate mamas and daddys. Emmy riding Susie Q and Lily riding Jelly Bean. Looks like a fun day. That hamburger sounds so good! 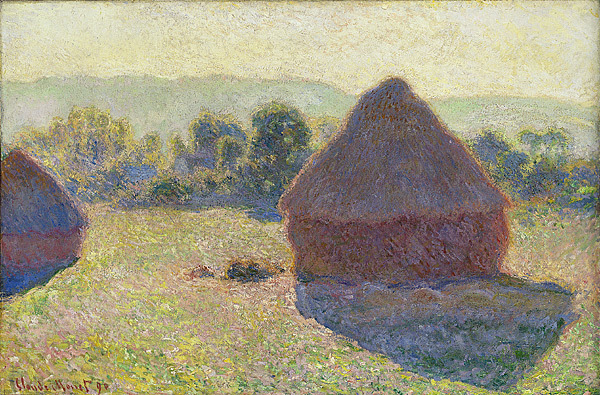 Love the Claude Monet picture, so sorry about your books. We hope to go in a few weeks. So glad you had such a fun day with the girls. So cute! Did you catch (and/or eat) any worms as well? I am not too fond of mazes, since I always get lost. Or is that a labyrinth? Oh my goodness, that last picture is adorable! Looks like a lot of fun! They make it a full day of fun at those places now, and boy did you have it! 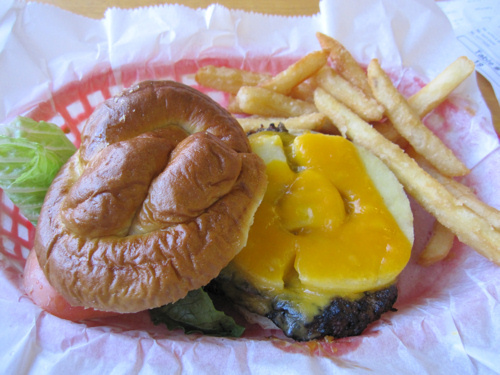 That apple cheeseburger is so weird, yet oddly appetizing! Looks like so much fun. 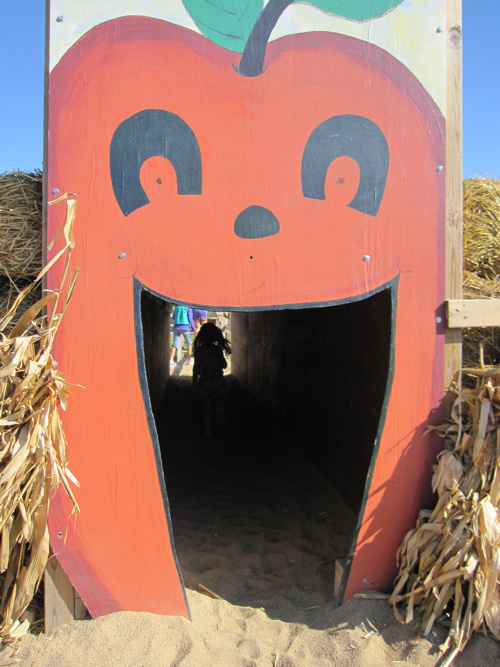 We will be heading to our annual pumpkin patch location next weekend. I can't wait.